Bill English is back on a sheep farm. It's not in his hometown, Dipton, but in Hokkaido, Northern Japan. The Prime Minister travelled around the globe to talk up the Trans-Pacific Partnership (TPP) deal, taking some time to meet the locals. He also met the Japanese Prime Minister, Shinzo Abe, in Tokyo who is making a move to get the TPP deal going again. And there's a reason - North Korea. "There's always been an argument for TPP as a way of providing stability in the region", Mr English says. "And that's become a more relevant argument as people have seen this growing threat from North Korea." The TPP used to be 12 nations led by the United States, until Donald Trump pulled out. But now, Japan has stepped up to lead what is called 'TPP 11' which Mr English says is "as much of a strategic deal as a trade deal". Shinzo Abe wants to step up and take up where Barack Obama left off as boss of the TPP. It would only take 13 minutes for a North Korean missile to hit Tokyo and Shinzo Abe today met with an envoy for the South Korean President as part of his strategic mission. 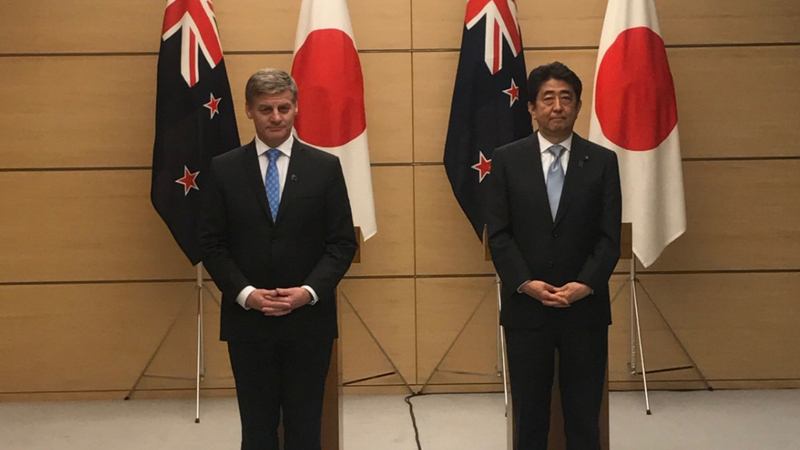 Japan's involvement makes TPP11 worthwhile, and New Zealand will now lead talks in the coming days to try and finish off the deal. "Like minded countries working together sticking together building on the relationships they have - always helps to reduce the chances of conflict and tension", Mr English says. But Mr English says they'd still prefer the United States back in the agreement.